DIE Martis, 29 die Januarii. Message from thence, with a Bill; and to return Ly. Roos's. E. of Manchester, Cook, and Sir F. Norris, Pet. to be heard about it. This Day the Lord Privy Seal sat Speaker, in the Absence of the Lord Chancellor. Hodie 2a vice lecta est Billa, "An Act for relief of poor Prisoners, and setting them on Work." Vicecomes Say & Seale. Epus. London. Their Lordships, or any Five; to meet on Thursday next, at Three of the Clock in the Afternoon, in the Prince's Lodgings. ORDERED, That the Committee for Privileges do meet on Thursday next, in the Afternoon, about the Lord Darcie's Complaint. The Lord Arlington signified to the House, "That His Majesty hath appointed this Afternoon, at Three of the Clock, to be the Time for the Select Committee of both Houses to attend Him at Whitehall, about the Address concerning the French Merchants." To acquaint them, that the King hath appointed this Afternoon, at Three a Clock, to be the Time for the Select Committee of both Houses to attend Him at Whitehall, concerning the French Merchants. 1st. To return the Bill for illegitimating the Children of the Lady Anne Roos; to which the Commons have assented. 2. To present a Bill, intituled, "An Act for enabling Trustees to make Leases, for Payment of the Debts, and providing for the Children, of Sir Charles Stanley;" to which their Lordships Concurrence is desired. Hodie 2a vice lecta est Billa, "An Act for settling the Estate of the Lord Norris in Trustees, for the Benefit of the Lord Norris." Upon this Occasion, a Petition of the Lady Cholmely was read; desiring, "That Edward Cooke Esquire, her Husband, being a Trustee formerly named, he being now in Ireland, might be heard before this Bill be passed." Also it was signified to this House, "That the Lord Chamberlain and Sir Francis Norris, Persons concerned in this Bill, desired to be heard before the passing of this Bill." The Question proposed was, "Whether this Bill shall be now committed?" And the Question being (fn. 1) put, "Whether this Question shall be put?" Then the Question being put, "Whether this Bill now debated shall be now committed?" Their Lordships, or any Seven; to meet on Thursday Morning, at Nine a Clock, in the Prince's Lodgings. 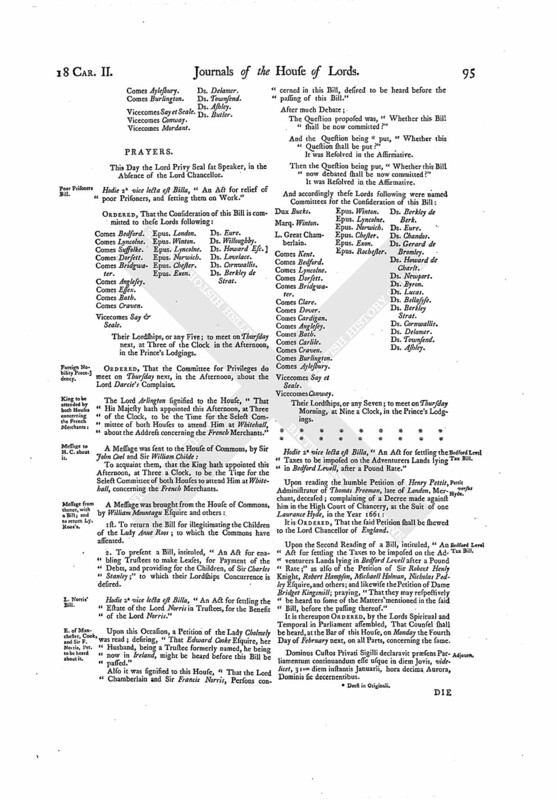 Hodie 2a vice lecta est Billa, "An Act for settling the Taxes to be imposed on the Adventurers Lands lying in Bedford Levell, after a Pound Rate." It is ORDERED, That the said Petition shall be shewed to the Lord Chancellor of England. 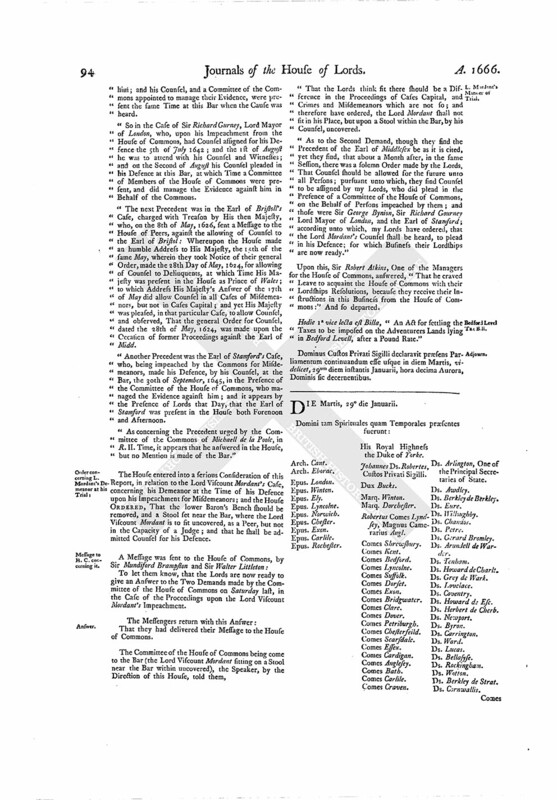 Upon the Second Reading of a Bill, intituled, "An Act for settling the Taxes to be imposed on the Adventurers Lands lying in Bedford Levell after a Pound Rate;" as also of the Petition of Sir Robert Henly Knight, Robert Hampson, Michaell Holman, Nicholas Pedley Esquire, and others; and likewise the Petition of Dame Bridget Kingsmill; praying, "That they may respectively be heard to some of the Matters mentioned in the said Bill, before the passing thereof." It is thereupon ORDERED, by the Lords Spiritual and Temporal in Parliament assembled, That Counsel shall be heard, at the Bar of this House, on Monday the Fourth Day of February next, on all Parts, concerning the same. Dominus Custos Privati Sigilli declaravit præsens Parliamentum continuandum esse usque in diem Jovis, videlicet, 31um diem instantis Januarii, hora decima Aurora, Dominis sic decernentibus.